2017 winner and UCLA graduate student Leslie Rith-Najarian receives her check in the crowning moment of Grad Slam from UC President and Grad Slam emcee Janet Napolitano. A UCLA psychology student claimed the Grad Slam championship Thursday, explaining in three crisp and engaging minutes how her research into depression and anxiety led to development of an online tool to help college students cope with stress. Leslie Rith-Najarian won the systemwide trophy — known as the Slammy — after edging out lightning-paced presentations on everything from building a tabletop particle accelerator to understanding how brain chemistry helps parents love their children. Rith-Najarian, who became interested in addressing mental health issues after losing two friends to suicide when she was an undergrad, said she was encouraged by winning the top prize. Second place finisher John Felts enjoys a moment of banter with emcee Napolitano. Now in its third year, Grad Slam helps master's and Ph.D. students strengthen their communications chops by challenging them to present their research in three engaging, jargon-free minutes. The contest, which was livestreamed, is one of the ways that UC is helping grad students hone the skills to explain what they do — and why their work makes a difference — to the public outside academia’s ivory tower. 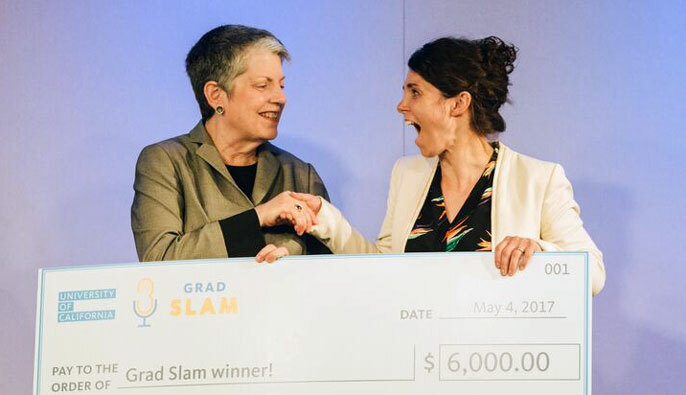 Those skills are particularly needed now, at a time of heightened skepticism about the value of university research and scholarship, said UC President Janet Napolitano, who has emceed Grad Slam since its inception in 2015. KTVU morning news anchor Pam Cook was among the judges. The contest was held at the San Francisco headquarters of LinkedIn. Napolitano was joined by a panel of leaders from industry, the media and higher education, who had the difficult task of choosing first, second and third place winners from among the presenters. Participants were judged on how well they engaged the audience, how clearly they communicated key concepts and how effectively they focused on and presented their idea — all in 180 seconds or less. This year, for the first time, the judges had help from viewers themselves, who were able to vote online after the contest to select a People’s Choice winner. That award went to UC Santa Barbara’s Leah Foltz, who discussed her research to cure a certain kind of blindness by finding and editing typos in a person’s DNA, then using that material to grow new healthy cells that can be inserted back into the patient’s eye. UC Berkeley's Kelly Swanson tells the audience about "Tabletop particle accelerators: Ultrapowerful compact machines" in just three minutes. The 10 outstanding presenters who faced off Thursday had worked their way through qualifying rounds at their respective campuses where each had claimed first prize in similar contests. Each had spent months practicing and preparing their pitches. “What I took away from this is how to approach my research from the perspective of someone who doesn’t have half a decade of background in the subject,” said UC Davis contestant Sam Westreich. He uses powerful computational software to catalog the trillions of microbes that inhabit our gut. To craft his talk, he sought advice from people outside his field, including family, friends, roommates, and fellow students — virtually anyone he could get to listen. UC Grad Slam winner Leslie Rith-Najarian with her fellow contestants. For Rith-Najarian, whose research deals with concepts familiar to most people, the key to producing a compelling talk was in making the case for why the work is important. “This research isn’t rocket science — but mental health affects everyone, on every day,” she said. She focuses on preventing anxiety and depression among college students — not an easy task when some students consider stress a badge of honor. Just as diet and exercise works to keep the body healthy, simple interventions like getting enough sleep, practicing mindfulness and carving out time for hobbies and social interaction have been shown to improve mental well-being, she said. But just like with physical health, the trick is in motivation. Some of that, according to Rith-Najarian, comes down to marketing. Her online program rewards students for practicing positive habits to strengthen their mental health. She also tested how to get students to sign up — and found that she needed two different program names to get both men and women to participate. Women were more likely to sign up for the Happiness Challenge, while ReBoot Camp appealed to males. Other than the names, the two programs are exactly the same, and have shown marked improvements in mood among the 5,000 students who use the program. The trick isn’t knowing how to improve mental health, it's getting people to stick with those activities, she said. “Effective programs are out there — we just have to figure out the right incentives to get people to use them,” she said. Along with bringing home campus glory, Rith-Najarian won $6,000 in prize money — which she said will reduce her need to take on extra teaching loads and give her more time over the next few months to focus on her research. Felts, Hollett and Foltz also took home cash prizes, after dazzling the judges with their high-impact research. Second-place winner Felts described how he is making a sustainable surfboard out of — of all things — shrimp shells. The polyurethane used to make surfboard blanks takes 500 years to degrade. “Surely, there must be a better material,” he said. He thinks he’s found the answer in a natural foam made from the tiny fibers in shrimp shells — and together with his advisor has filed a patent on the invention, which they call Cruz Foam. Third-place winner Hollett described how he is working to use geometry to advance safe access to reproductive health for women in developing countries. He explained how the cube-like shape of crystal molecules in certain birth control methods contribute to their virulent side effects. Opting for a different molecular material — one shaped more like a wire — can substantially reduce these negative effects. UC Grad Slam judges from left to right: Eric Huang, Aimée Dorr and Pam Cook. Along with offering the public a fun and engaging window into research, the event also strives to connect the talent emerging from UC graduate programs to California employers. This year’s event brought UC Ph.D. alumni from some of the Bay Area’s top employers — including Facebook, Salesforce, Kaiser Permanente, Genentech and McKinsey & Company — to network with participants and “minute-mentor” students over the lunch break, as judges tallied their scores. UC San Diego Grad Slam participants and grad students Suzanne Rohrback and Jonathan Trueblood were there to get perspective on the wide range of careers that are possible with a graduate degree. “There is so much more out there than I was aware of,” said Rohrback, a genomics grad student who studies how brains develop. Many of the UC alumni watching the talks said they wished they’d had an opportunity like Grad Slam when they were in school. “I think it’s brilliant,” said Eddie Santos, a UC Santa Cruz physics Ph.D. who now works in machine learning at Airbnb. Graduate students offer the razor sharp intelligence and fearless problem-solving that companies seek, he said. One skill many lack, however, is an ability to describe the research they’ve dedicated years of their lives to in a quick and descriptive fashion.